What does a gun blowing up and holiday eating have in common? You are here: Home / Contest / What does a gun blowing up and holiday eating have in common? That is what it has in common. Never give up! PS If you want to know more about the contest deadline keep reading. Information down below. The cracked barrel in the upper left is a very rare and infamous occurrence. This a very rare occurrence and it happened to me last night during our training and qualification at the Sheriff’s department. I still have the chills thinking about it and all the deep meaning it has in my life. Vaclav wrote this about my initial transformation several years ago. It applied then as it applies now. What happened last night was called a “squib load” and it’s a very rare and infamous occurrence that gets a lot of attention when it happens. It happened to my very precious and expensive Wilson 1911 (for those who understand guns). I am still kind of in shock about it and my beautiful piece of machinery being so broken still makes me want to cry. Emotionally I’m waffling between sadness about it and yet deeply thankful that it didn’t happen on duty or that my hands or face didn’t get blown up. Instead I’m just stuck with some emotions and deep thoughts about life in general (and a very much broken masterfully made piece of machinery). So how does this apply to us at Venus and the holidays? 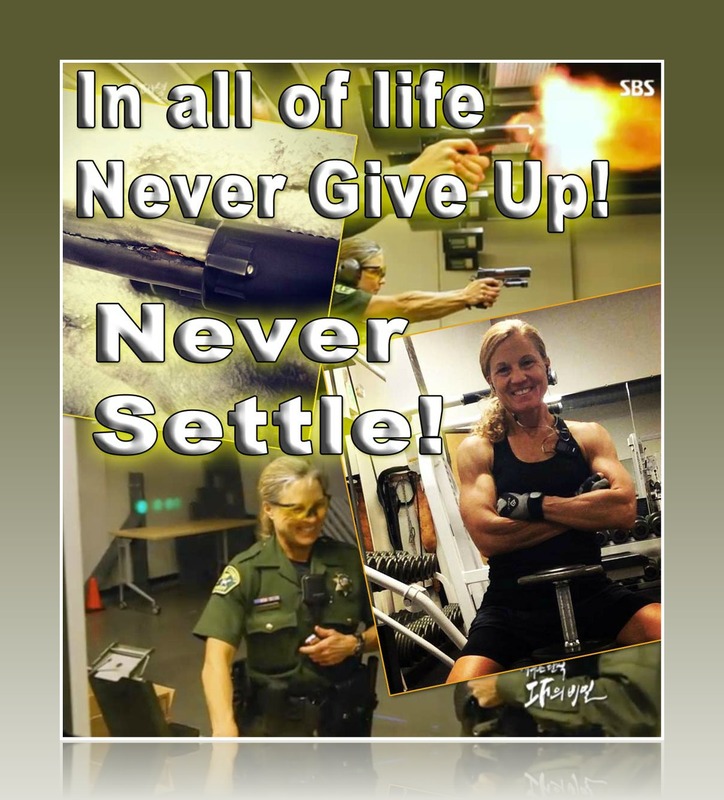 Last night’s incident with my gun blowing up reminds me that we all must NEVER GIVE UP. First, it was nobodies fault. Stuff happens. It’s life. I am very lucky no one was hurt and that it the drill itself was TRAINING. The malfunction however COULD happen in a real life scenario on duty. The training and qualification scenario was this: I was advancing on a threat with my shotgun. Aggressively walking forward and firing the shotgun. When I got up to close range I ran out of ammo in my shotgun so transitioned to my handgun. I proceeded to rapidly empty it into the threat. But after several quick rounds it “jammed”. I attempted the failure drill and quickly realized it totally broken and saw the cracked barrel. Lucky it was training/qualification. My initial reaction was deep sadness for my most precious beautifully machined mechanical item and I really wanted to cry for a second about that. I thought Oh My God and in fact I think I said that. The range master quickly came over, saw what happened to it, quietly took it from my hands and set it safely on the shelf nearby and all he said was “FOCUS!” Then he proceeded to finish teaching the class. So had this really happened on the street what would I do? I was at close range. Did I have a backup plan? I would need to keep the mindset of NEVER GIVE UP. We all need to work on that AHEAD OF TIME. I have a lot to think about now. And it was a perfect reminder that this applies not only to our physical training at the gym, out on runs, driving our cars, on our jobs, at the mall, at home with our families, in EVERYTHING WE DO. I stole this saying from a Jillian fitspiration poster on Facebook. The same thing with diet and the holidays. We don’t have to give up. Enjoy those feast days but the pressure increases and strategies fail. Never give up on that either. It doesn’t have to be all or nothing. We are human. We are messy. We will have moments or days of feasting, but it doesn’t have to go on for days on end. You are not doomed. You have a choice. You have options. You can DECIDE to stop at any time. You can have just a little portion control and maybe some days in between of “dieting’ so to speak, or just a little bit more in control. Even eating at maintenance a few days is a WIN. You don’t have to over eat at every meal every day during the season. We have to deal with it every year. Why not embrace it with a plan and a backup plan? We live our habits for life. Don’t give up just because the holidays are hard. OWN what you put in your body. Don’t let anyone else own it. What about the contest deadline? Many of you will be submitting the final pictures for the contest this weekend. In the 12 weeks of hard work and focus some of you may have forgotten where the contest entry form is. It’s the same form you used to enter the contest. Get your final entries in by midnight Eastern time November 24th. We will be setting a schedule soon for next years contests. There will be 3 contests and the first will start in mid January so you can all enjoy the holidays (even without giving up!) Keep your eyes peeled for an email from John and Brad Howard regarding the schedule. Once that is all settled we shall post it here on the website as well. Have an awesome weekend! I can’t wait to see all the beautiful pictures of hard work and dedication! PS just for fun here’s one more thing my new awesome expert martial artist friend Jarrod and I will never give up on. A few years ago I couldn’t do a pushup or curl up, so once again, NEVER GIVE UP applies to all of life.